I now have a hairdresser that I fully trust, and she does a fab job every single time. Don't you just love it when you find someone like that? I only recently got a touch up of my blonde balayage, although it is a much lighter blonde to what I had before. It looks quite silvery/platinum in some lights, which I love. Since I've had blonde balayage for over a year now, I feel like I have got a good hair routine going, and I know just how to take care of it. It can be quite a challenge to keep the brassy tones in my hair at bay, but that's where the purple shampoo comes in. I use the Pro Voke Touch of Silver Brightening Shampoo(£3.19, now £2.12) every single time I wash my hair, which is only every three days, and that's if I'm lucky. If my hair starts to get oily quite early on, I just shove my hair up in a pony tail or a top knot, haha. I have used the Brightening Shampoo on and off for years. Believe it or not, a few years ago my hair was platinum blonde, and this was my go to shampoo. It has violet pigment which tones down the brassy tones and brightens too. It's truly wonderful. What's even better, is it's super inexpensive too! It lasts quite a while as well. I bought a new bottle straight after I got my hair coloured and I haven't even got halfway through. It is only a 150ml bottle, isn't that great?! The only downfall is that, if you use too much and leave it on for longer than the 5 mins recommended then you will notice a purple tinge in your hair. I made that mistake all those years ago, and ended up with a full head of purple hair, haha. It does wash out after around two washes though, so that's not too bad. 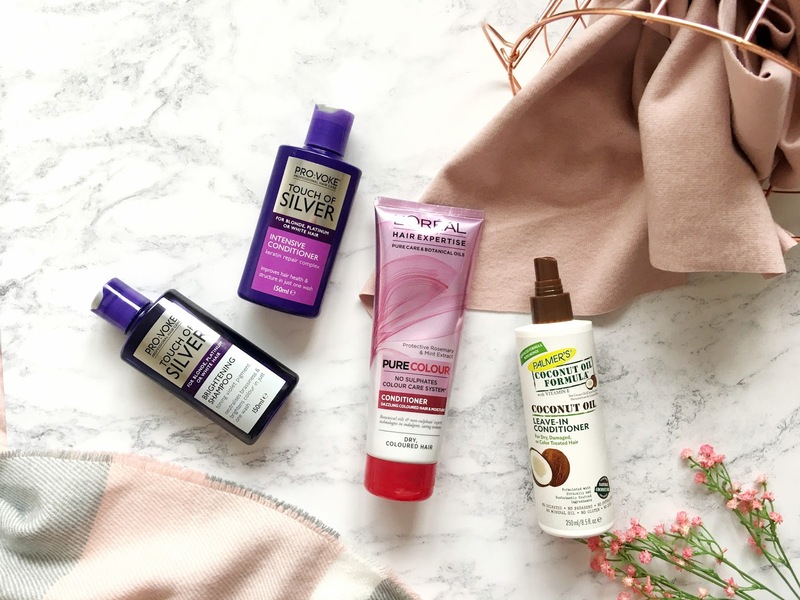 I have two conditioners which I go between, the Pro Voke Touch of Silver Intensive Conditioner(£3.19, now £2.12) and the L'Oreal Hair Expertise Pure Dye Moisture Conditioner(£6.29). What a name, eh? They are both designed for dry and coloured hair, but I only ever use the Pro Voke Conditioner when I want to further remove any of the yellow tones in my hair. It does a wonderful job of removing the brassiness, but it also leaves my hair feeling so moisturised and soft after too. The L'Oreal Moisture Conditioner is free from SLS, which is so kind to the hair and pro longs my hair colour. It has a lovely creamy formula, but as it's SLS free, it doesn't lather up like other conditioners. It makes my locks look so glossy and it feels so nourished and silky smooth too. It has a herbal scent to it which is down to the rosemary and mint oils, but I love it. It's a very refreshing smell. After that, I like to use a leave in conditioner. The Palmer's Coconut Oil Leave-in Conditioner(£4.99) to be precise. My hair can get quite tangled after washing it, which is where this comes in. It detangles, reduces frizz and hydrates my hair. It is an absolute dream to use. I spray it through the mid to end lengths of my hair before blowdrying and the end result is incredible. My hairbrush glides through my hair with such ease after using this. It smells so bloomin' good too!